One of the best pubs in Ealing for beer, The Foresters is home to six real ales and seven lagers on tap, as well as an outstanding variety of bottled beers from around the world. 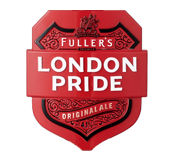 Proud proponents of quality as well as quantity, we take real pride in the condition of our beer, with all senior members of staff recipients of Fuller’s Cellarman Award. We also play host to large scale beer festivals multiple times through the year - the perfect opportunity to find your next top tipple. If you’re not big on beer, rest assured we’re well stocked with spirits too - with plenty of gins, rums and whiskeys to tickle your fancy.